The new 34th Edition Blue Book of Gun Values has just been released, and is available now for $29.38. 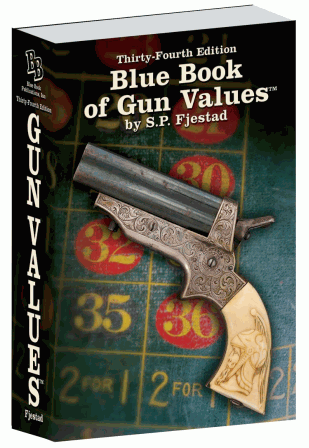 The Blue Book of Gun Values, by S. P. Fjestad, is the top-selling book in our AccurateShooter Bookstore which operates through Amazon.com. The 34th Edition of the Blue Book has 2,408 pages, easily making it the highest page count of any firearms book currently in print. This resource includes nearly 1,500 gun manufacturers, almost 20,000 gun model descriptions, and over 175,000 prices! New 2013 domestic and imported makes and models have been included. All gun values have been thoroughly updated for both modern and antique firearms, including the recent paramilitary style guns. Other features include the 80-page color Photo Percentage Grading System (PPGS) and serialization and proofmark sections to help in identifying firearms. The Blue Book of Gun Values is the firearm industry’s most trusted reference book with over 1.5 million copies in print. 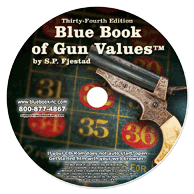 The Blue Book’s Publisher now offers a CD-ROM version of the Blue Book of Gun Values. Priced at $34.95, this contains all the information from the printed version of the 34th Edition Blue Book of Gun Values as well as over 3,500 color images packed on an easy-to-use disc. The Blue Book of Gun Values is now available as an online subscription for $34.95. The online subscription contains the entire database of the current Blue Book of Gun Values, but it also has many features not available with the printed version, including quarterly updates, over 2,500 firearm images, complete search abilities, and inventory capabilities. You can also get a combo package of book and online data access. If you purchase the book directly from the publishers for $44.95, for an additional $5.00 you can get a one-year online subscription. You must use discount code 34GUNSUB5 at checkout to receive the $5 subscription. To assist Blue Book readers, Blue Book Publications has created a nine-part instructional video series on YouTube. Part 1, the Introduction, provides an overview. Each of the other eight (8) short videos explains a key feature of the Blue Book of Gun Values and how to best utilize it. Watch one or more videos, according to your interests. Share the post "New 34th Edition of Blue Book of Gun Values Now Available"